Subjects, styles, advertising, other relevant information: Peter Lofts worked for Edward Leigh before setting up on his own at 1a Carlyle Road, Cambridge (Kelly's Cambridge Directory 1969). In 1969 he was in partnership with Frank Bird as Lofts Bird Partnership, then the partnership was re-named "Cambridge Photographers", operating first at Carlisle Road Cambridge, then at 47 High Street Trumpington. Peter left the partnership and went to the USA and London, later returning to Cambridge to open a studio at Frenches Mill, Frenches Road, off Victoria Road (Cambridge Yellow Pages 1980 and 1981). In 1980 Peter purchased the business of Ramsey and Muspratt in Post Office Terrace, Cambridge, overnight becoming the owner of a huge archive of negatives, mostly on glass plates, dating as far back as the 1860’s. He was listed at the Post Office Terrace address in the Cambridge Yellow Pages from 1981-1984. The area was re-developed in 1985 and in that year Peter was listed in the Cambridge Yellow Pages with an address at 52 Argyle Street Cambridge. Peter later worked for Eaden Lilley, and his name appeared in their advertisement in the Cambridge Yellow Pages in 1995 with that of fellow photographer Ian Bethell, LMPA. Subjects, styles, advertising, other relevant information: Son of Ralph Herbert Lord, briefly part of his father's firm - see full entry for Ralph Herbert Lord. References: England census 1901, 1911. Address: Bridge House Newmarket Road, Cambridge. Subjects, styles, advertising, other relevant information: Thomas Cordukes Lord was the son of Henry Lord, photographic artist b: 1816 Berrybrow Almondbury Yorkshire and Mary Lord b: 1819 Huddersfield. Henry was a painter in 1851 but had become a photographer before 1861. In 1871 the family lived at King Street Huddersfield. The oldest son of the family at this residence was James W Lord, b: 1834 Marsh Yorkshire, a professor of music. Thomas C Lord was the next oldest son at home and his occupation was shown as an accounts clerk. Ralph Herbert Lord was the next oldest son at the family home and he was a photo artist's assistant, no doubt working for his father. Finally, in 1871 John Edwin Calvert Lord was the youngest son aged just 10, a scholar. In 1876 Thomas married Martha Ann North b:1852 Mirfield Yorkshire, and in 1881 they were living at 43 West Parade Huddersfield. They had two children, Victor Norman Lord b: 1878 and Percy H Lord b: 1881. Both children were born in Huddersfield where Thomas was the Secretary of the local branch of the Young Men's Christian Association. This would have been a large and active organisation - they had around 350 members in 1883 with educational classes in singing, elocution, French, German and shorthand, they ran a library and reading room, had clubs for rambling and cycling and their annual excursion to Blackpool in August 1881 involved no fewer than 700 persons (Huddersfield Chronicle 5 Aug 1881 p3 and 10 July 1883 p3). Sadly young Victor died in 1882, and in September 1886 after 7½ years as YMCA Secretary Thomas moved to Cambridge and changed his occupation. By 1891 Thomas and his family were living at Bridge House in Newmarket Road Cambridge. His family comprised his wife Martha, son Percy H Lord b: 1881 Huddersfield and daughter Ada Geraldine Laura Lord b:1887 Cambridge. Thomas was described as an artist photographer and an employee. We cannot know for certain, but it seems likely that Thomas came to Cambridge to work with and be employed by his younger brother Ralph, who was by then a successful photographer in the town. By 1901 Thomas and his family had moved North to Pendleton Lancashire. The family were living at 3 New River Street Pendleton and Thomas was employed as a concrete and asphalter's manager. His younger brother, John Edwin Calvert Lord, b:1861 Huddersfield, had a career in construction, having been a joiner in 1881, an architect and railway contractor in 1891, an asphalt contractor and manufacturing chemist in 1901 and a tar distiller and contractor in 1911. He was obviously successful in what he did as he and his wife Sarah Ann were living in a 12 room house in Salford, with two residential servants in 1911. It seems likely that it was John's success in this field which one way or another drew his two brothers, Thomas and Ralph to Lancashire and into the asphalt business. In 1911 Thomas and his family were living in Middlesborough at Stirling House 4 Vest View Terrace Marton Road, and his occupation was shown as chemical manufacturer and contractor's manager. The family had a live-in 19 year old servant. Thomas died in 1932. At the time of his death he was living at the same Middlesborough address. His estate was worth £3110. References: England Census 1871 - 1911. References: No trace found at this stage in local directories. 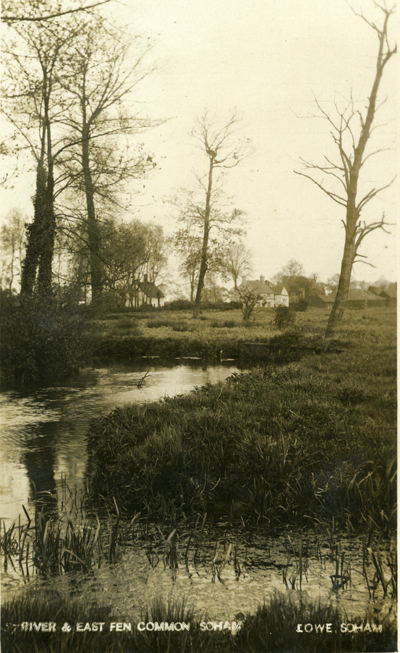 Subjects, styles, advertising, other relevant information: In 1911 Robert was living in Buckley Road, Eynesbury with his wife Agnes (née Johnson b:1879 St Neots) and children Millia (b:1901 St Neots) and Clarence (b:1907 St Neots). Robert was employed as a mill hand - paper finisher. Said later to have a photographic studio in the back garden of his house. 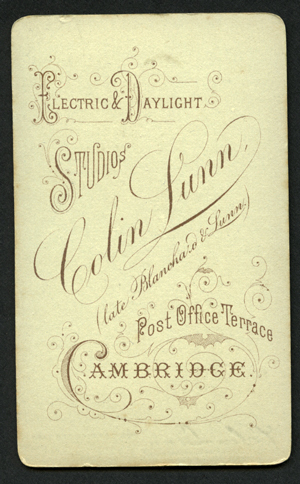 Working Dates: Following the demise of the partnership Valentine Blanchard and Lunn, Colin Lunn (who for the sake of clarity we will call Colin Lunn Jnr) took over their studio at Post Office Terrace from 1889 - 1893. The earliest record found for Colin Lunn Jnr is his wedding on 8 July 1890, recorded in the Cambridge Chronicle on 11 July 1890, to Miss Rose Elsdon b:1866 Sawbridgeworth Hertfordshire, of The Vinery Milton. Colin Lunn's addresses were given as New Square and Post Office Terrace Cambridge. The wedding certificate recorded that Colin Lunn Jnr's father was Thomas Lunn, a gardener (of whom no trace has yet been found). Among the guests at the wedding were Mr and Mrs Colin Lunn (Snr) and Miss Lunn all of Richmond, Surrey. Colin Lunn Snr was also a witness at the wedding. In 1891 Colin Lunn Jnr was living at 30 New Square Cambridge with his wife Rose and his occupation was shown as photographer. Colin Jnr described his studio as the "Electric and Daylight studio" at Post Office Terrace. Valentine Blanchard's partner in the firm of Valentine Blanchard and Lunn was William Henry Lunn. In 1871 William Henry Lunn, b.1860 at Newport Essex, was living with his parents at 3 Bridge St Cambridge. His father was Colin Lunn b.1825 Sydenham Kent (who for the sake of this account we will call Colin Lunn Snr). He was at the same address in 1881 and was shown as having no occupation. William Henry's father, Colin Lunn Snr, was in 1851 and 1861 the butler at Shortgrove Hall, Newport Essex, an establishment which then had 11 servants. On 11 April 1890 the Cambridge Chronicle (P7) recorded that Mr C Lunn (Snr), sidesman for many years at Holy Sepulchre Church Cambridge, had left the Parish. In 1892 Colin Lunn Snr died. At that time he was living at 13 Onslow Road, Richmond, Surrey. His executors were his wife, Mary Shearer Lunn and Colin Lunn, photographer. No trace of William Henry Lunn can be found after 1889. It seems likely that William Henry Lunn and Colin Lunn Jnr were related in some way - possibly their fathers, Colin Snr and Thomas, were brothers or cousins, but no evidence of this has yet been found. Colin Lunn Snr's parents were William Lunn b:1788 Hurst Berkshire, a dairyman, and Elizabeth b: 1791 Croydon. The facts that Colin Lunn Snr was a witness at Colin Jnr's wedding and also made him an executor of his will suggest a close relationship between them. Colin Lunn Jnr's background prior to his wedding in 1890 has yet to be discovered and it remains a mystery what happened to William Henry Lunn after the breakdown of his partnership with Valentine Blanchard. 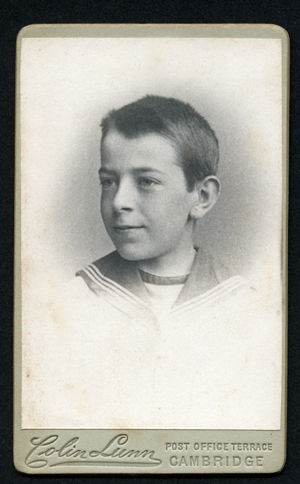 See below carte de visite from the author’s collection of a vignette of a boy in a sailor suit. On the face of the mount “Colin Lunn Post Office Terrace Cambridge" and on the rear "Electric and Daylight Studios Colin Lunn (late Blanchard and Lunn) Post Office Terrace, Cambridge" 1891-2. Mount coloured grey with rounded corners and impressed lettering on face. 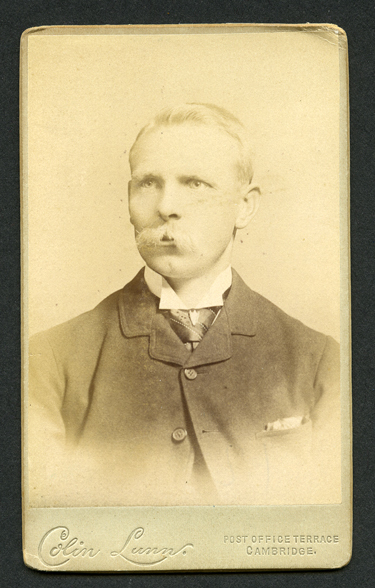 Below this is a later example carte de visite, of a gentleman with moustache on a light grey mount with impressed text on the face "Colin Lunn Post Office Terrace Cambridge" the reverse is blank but has a negative number 12667 written thereon - suggesting that Lunn may have continued his predecessor's numbering sequence. On 30 May 1891 the Cambridge Independent Press (p6) reviewed a publication Norfolk Broads, by Colin Lunn (Photographic Studio. Post Office Terrace, Cambridge.) stating: "This is the title of an attractive album of photographs, taken by Mr. Colin Lunn, during several trips, of these favourite holiday haunts — the Norfolk Broads. The volume which is nicely bound,contains twelve photographs, mounted on cardboard, of the most well-known spots of the Broads, with descriptive letterpress on the opposite page. All the photographs are very clear, "Home at Last" (Gorleston Harbour), "Homeward Bound” (Lowestoft), and “Outward Bound” (Gorleston), Horning Ferry, Salthouse Broad, and Bt Bennet’s Abbey being especiallv good. Some interesting fact is told about each place, and the whole forms a very pleasing memento ot a visit to the Broads." The Cambridge Evening News on 1 March 1993 reported in its "100 years ago" column that in 1893 J Palmer Clarke, Bury St Edmunds photographer, had taken over Colin Lunn's Post Office Terrace Studio. By 1901 Colin Jnr had moved with his family to 167 Banbury Road Oxford where he was listed not as a photographer but as a cigar merchant. Living with him were his wife Rose and daughters Elsie Winifred (b:1892 Cambridge) and Phyllis Audrey (b:1893 Cambridge), plus one live-in servant. In 1911 he was at the same Oxford address with his family and his occupation was listed as a tobacconist. Colin Lunn Jnr was in turn succeeded at Post Office Terrace by J Palmer Clarke, who was advertising his presence there in May 1893 (Cambridge Chronicle 12 May 1893 p4). 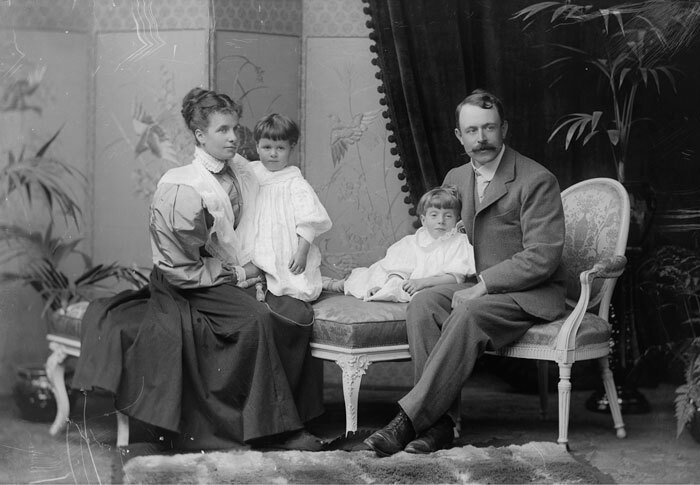 The studio portrait below (reproduced with the permission of the Cambridgeshire collection is from the negatives from Post Office Terrace Studio and shows Colin Lunn, his wife and two daughters. The youngest child appears to be about three years old, and so the portrait is probably from around 1896, and is therefore by J Palmer Clarke. It seems that Colin Lunn stayed in touch with his successor because un-dated negatives of portraits of Miss EW Lunn and Miss PA Lunn both of 167 Banbuty Road Oxford can be found among the negatives from Post Office Terrace in the Cambridgeshire Collection PCB 135/42-51. This paragraph might prove to be an unrelated snippet, but it is recorded here until it can be ruled out of the story of Colin Lunn. In "The Autobiography of an old drifter" pub by George G Harrap and Co Ltd 1936, another photographer, Percy M Clark b: 1874 d: 1937, mentions a friend, Colin Lunn. Percy Clark was, for a year, a photographer working in Cambridge for RH Lord, before working as a photographer at Lowestoft, London, Norwich, and eventually for many years at Victoria Falls in Rhodesia. His autobiographical work is full of interest, but lacks dates for many of the events portrayed. At page 196 Percy writes: " About this time I heard from an old friend Colin Lunn, with whom I had lived in Norwich before coming out to Africa, telling that he was on his way to Rhodesia. Since it was on my urging that he was coming, I thought it only proper that I should go to Bulawayo and give him a welcome on arrival.....I met my friend and he was glad to see me after his long journey. When I sent for him to come out to Africa I had a job fixed. But for reasons that I needn't go into he could not get away in time and the post was filled when he arrived. I established him, however, in another, and he settled down bravely in Bulawayo to get himself a living." From Clarke's description of his journey to meet Lunn, this appears to have been before the railway to Victoria Falls opened in 1905 - so possibly around 1903/4. Could Colin Lunn, resident in Oxford in 1901 and 1911, have gone to Rhodesia at some point between those dates? Name: LUNN William Henry b: 1860 Newport Essex d: ? Subjects, styles, advertising, other relevant information: There remains something of a mystery about William Henry Lunn. He was the son of Colin Lunn b.1825 Sydenham Kent (who for the sake of this account we will call Colin Lunn Snr). In 1871 William Henry Lunn was living with his parents at 3 Bridge St Cambridge. He was at the same address in 1881 and was shown as having no occupation. William Henry's father, Colin Lunn Snr, was in 1851 and 1861 the butler at Shortgrove Hall, Newport Essex, an establishment which then had 11 servants. On 11 April 1890 the Cambridge Chronicle (P7) recorded that Mr C Lunn (Snr), sidesman for many years at Holy Sepulchre Church Cambridge, had left the Parish. In 1892 Colin Lunn Snr died. At that time he was living at 13 Onslow Road, Richmond, Surrey. Colin Lunn Snr also appears in the Surrey Electoral registers Eastern Division from 1866 - 1888 as a property owner with two houses at 24 and 25 Sumner Street Croydon which were occupied by tenants. William Henry Lunn became the partner of Valentine Louis Blanchard of Post Office Terrace Cambridge around 1888, trading as "Valentine Blanchard and Lunn". In 1889 William submitted to Stationers' Hall for copyright purposes two photographs he had taken, both described as "Photograph of a flash of lightning at Cambridge taken during the terrific storm of June 6 July 1889". Copyright owner and author of work: William Henry Lunn, 3 Bridge Street, Cambridge. Form completed 13 June 1889. In October of that year Blanchard and Lunn announced the dissolution of their partnership, the business to be carried on by W H Lunn. The Cambridge Independent Press announced on 9 Nov 1889 (p1): "Electric Light and Daylight Studios, Post Office Terrace, Cambridge. Mr W H LUNN begs to thank the Members of the University and Residents of Cambridge for their kind support and patronage during the past year. Having introduced skilled Assistants and made considerable improvements to the Establishment, purposes (sic) carrying on the Business as usual, which will in no way be affected by the Dissolution of Partnership. Proofs of high class artistic portraits will be submitted within a week of the sitting. Special and careful attention given to the Photographing of Gentlemen's Booms. 12 x 10 Groups taken Town or County. Agent for Ross's, Dallmeyer’s, and Beck’s Photographic Lenses"
Between October 1889 and July 1890 for reasons not currently known, a major change occured in that no further trace has been found of William Henry Lunn, but Colin Lunn b: 1860, Newport, (see entry above) had taken over the running of the Post Office Terrace Studio. References:TNA Copy 1/396/309 and 310. See above entry for Colin Lunn. Subjects, styles, advertising, other relevant information: BA in fine art. Commercial, industrial, press, advertising, aerial photography, weddings, social functions, portraiture.